At the southern end of Eld Inlet is Capitol Land Trust’s Randall Preserve which is 7 acres and is adjacent to the City of Olympia’s aquifer, Allison Springs. The Randall Preserve has been severely impacted by human use, but also boasts high-quality tidelands and is undergoing extensive restoration to provide native habitat for the many migratory and indigenous bird species inhabiting the property. Besides providing a buffer for Allison Springs, the Randall Preserve also includes important habitat for migrating Canada geese, salmon spawning at Allison Springs, coyote, black bear, deer, weasel, willow flycatcher, dark-eyed junco, mallard ducks, cormorant and cedar waxwings. Plan a visit to Randall Preserve to enjoy the scenery and wildlife! In 1997 Marjorie Randall donated a conservation easement on her property to Capitol Land Trust. She later donated ownership when she passed away in 2008. We were interested in the property because of its high-quality tideland and salt marsh ecosystems, home to many species of bird and marine life, including chum salmon. In addition, the property is adjacent to Allison Springs, another high-quality tideland and forest ecosystem fed by natural springs, owned by the City of Olympia. However, the Randall property has been heavily impacted by human use. Prior to any restoration activities, much of the salt marsh had been displaced by bulkheads, and there were four buildings on the property. Invasive species were prevalent in the upland areas, and there was (and still is) a heavily compacted dirt driveway that runs through the property. On top of all this, toxic containments were found in the soil. When Capitol Land Trust acquired the easement on the Randall property, a restoration plan was created to deal with these issues. Over the next decade, bulkheads and the house closest to the road were removed, the area was replanted with native trees and shrubs, and a large amount of trash and debris were hauled away. Now, in 2011, the plan is in the final stage of major operations. Last month the remaining three buildings were removed. However, the land beneath them had been artificially raised to keep the houses above water. This summer, work will be done to remove bulkhead material and reshape the shoreline so that tidal inundation can reoccur, allowing the area previously occupied by buildings to restore itself to a salt marsh once again. Also this summer, the roundabout driveway will be removed and the land prepped for planting in the fall and winter. Planting will also occur throughout the upland areas of the property, so that in a few years there will be a healthy belt of native vegetation to buffer the wetlands and salt marsh. 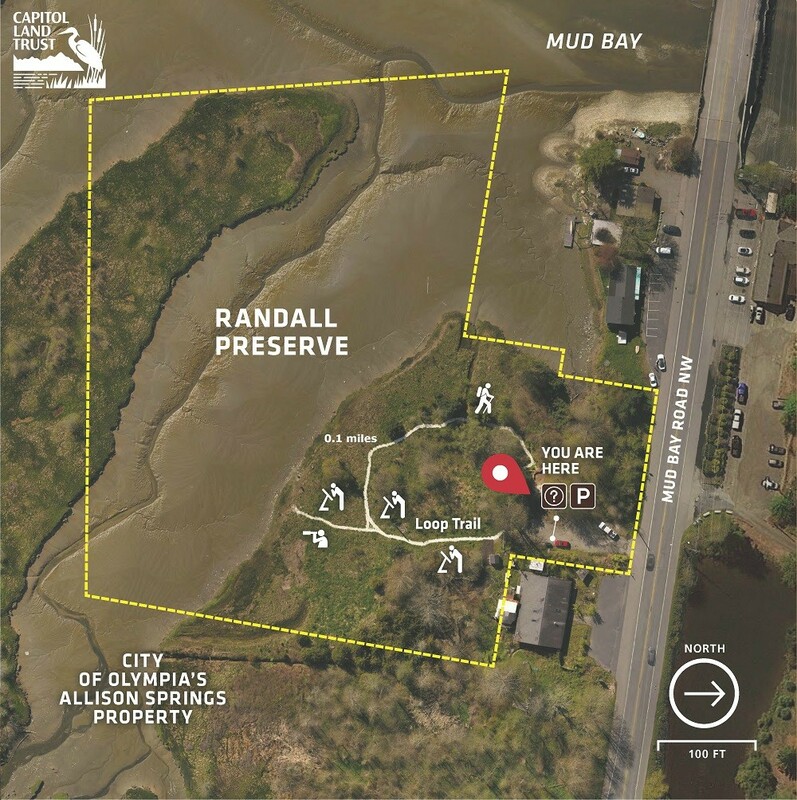 People for Puget Sound has adopted the Randall property as one of their stewardship sites, and has been helping Capitol Land Trust with stewardship activities on the property for a number of years. The Trust will be partnering with People for Puget Sound to finish the plantings after the earth moving is complete. This latest stage in the restoration at Randall is being completed as part of a combined project which includes restoration on the adjacent Allison Springs property. On that property, a pocket estuary was impounded in the early 1950’s with a series of earthen dams to create pools. These pools, fed by natural springs, were created to rear trout and salmon. Locals could go there to fish at “Allison’s U Catch Trout Farm.” In the years since, the pools have changed hands and purposes numerous times. By 1999 they were abandoned, and talk began about restoring the area back to its natural estuarine condition. In 2009 Capitol Land Trust received grants from the Salmon Recovery Funding Board, WA Department of Ecology and US Fish & Wildlife Service for restoration on the Randall and Allison sites. Working with partners including the South Puget Sound Salmon Enhancement Group and People for Puget Sound, the dams at Allison Springs will be removed and the natural estuary will be allowed to redevelop. By this time next year, all the man-made structures, alterations, and debris from both the Allison Springs and Randall sites will have been removed, thousands of young native plantings will be in the ground, and the future of Lower Eld Inlet will be much brighter.